This post A Tale Of Two Citigroups appeared first on Daily Reckoning. The time to buy bank stocks is now. More specifically, the time to buy shares of Citigroup (C) is now. Luckily for us, ValueAct also explains exactly why the market thumping investment firm is pounding the table on Citigroup today? What Is ValueAct's Track Record? Before we take a look at what ValueAct thinks of Citigroup, we need to consider whether ValueAct has a track record worth paying attention to. The answer to that in my opinion is a resounding yes. ValueAct was founded by Jeffrey Ubben in 2000. In the 17 years that followed, ValueAct has generated an annualized return of 15% which is far in excess of the performance of the S&P 500. I should point out that those 15% annualized returns are after ValueAct takes its management and performance fees. Excluding those fees, ValueAct has since inception generated annualized returns close to 20%. In a world where most active managers can't even match the performance of the S&P 500, these guys have proven that they can seriously pick some stocks! I must also point out that ValueAct manages a very concentrated portfolio. As of ValueAct's last SEC filing, the firm held only 12 different positions.2 That means that each investment has a big impact on performance and must be carefully researched, which means that their $1.2 billion Citigroup investment shows some major conviction? ValueAct has historically built its excellent investment performance on a value investment philosophy that leads the firm to sectors in the market that are temporarily out of favor. In the past, ValueAct invested successfully in bargain priced software firms after the Dot-Com crash. The firm had a similar experience with several big pharma companies that offered unfairly discounted share prices in advance of patent expirations. "The U.S. banking system now has a structurally lower risk profile than any time in our investing lifetimes' thanks to lower leverage and higher-quality assets held by the industry after the financial crisis." In other words, today is the perfect time to be investing in the banking sector. The balance sheets of the big banks have never been cleaner and the financial reporting never more transparent. Investors now know exactly what they are buying which allows them to clearly see how cheap these stocks have become. The Citigroup banking business has been around for quite a while. Citigroup's history dates back to the founding of the City Bank of New York in 1812. So the company has roots that are set a little deeper than those of Facebook or Amazon. Over the 200 years of operations, this company has been turned into a powerful global business. The numbers are mind-boggling. 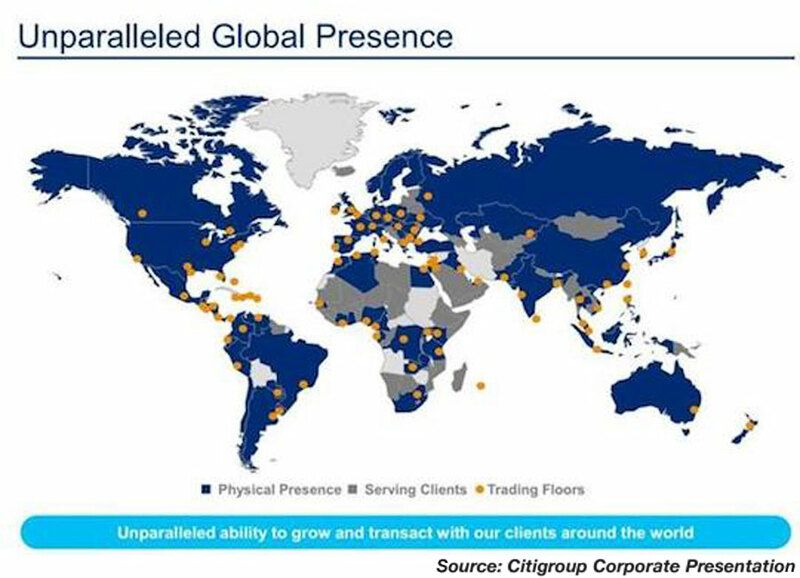 Citigroup's core consumer bank has branches in 700 cities around the world with more than 200 million customer accounts which sees more than $3 trillion worth of transactions on a daily basis. The power of this global business has never really been in doubt. But what is different now is how solid Citigroup's balance sheet has become. Further, Citigroup is about to see a massive increase in both earnings per share and the amount of cash that it returns to shareholders. In the years following the financial crisis, Citigroup has been forced by the Federal Reserve to retain most of the earnings that it generates in order to continue to build balance sheet strength. That earnings retention has limited the size of the dividend that Citigroup can pay and the amount of shares the company can repurchase. With each passing year, those restrictions are being eased. Those rising dividends and share repurchases will continue to be a catalyst for the share price. In ValueAct's recent letter to investors, the firm noted that it believes that Citigroup can return $50 billion to shareholders in the form of dividends and share repurchases in just the next two years. That is an incredible amount of money. ValueAct also believes that Citigroup can double its earnings per share by 2020. An earnings per share double is some pretty incredible growth for a 200 plus year old bank! I have to think that a $50 billion return of capital and a doubling of earnings per share in two years will do good things for Citigroup's share price. ValueAct Capital clearly does too, which is why I think now is a great time to buy your shares. The post A Tale Of Two Citigroups appeared first on Daily Reckoning.